There is a slight touch of the story but it is not the same. John( Arya) and Regina(Nayanthara) get married without their willingness and start their life. They hate each other to the core and in situation when Nayanthara falls ill he comes to know the flashback of Nayanthara and is reach touched and same way they Nayanthara comes to know Arya’s flashback and they fall in love with each. The flashback is that they are married before and have separated due to the death of their loved once. Once they fall in love they have reluctance about their love being accepted and the climax is how they both unite. 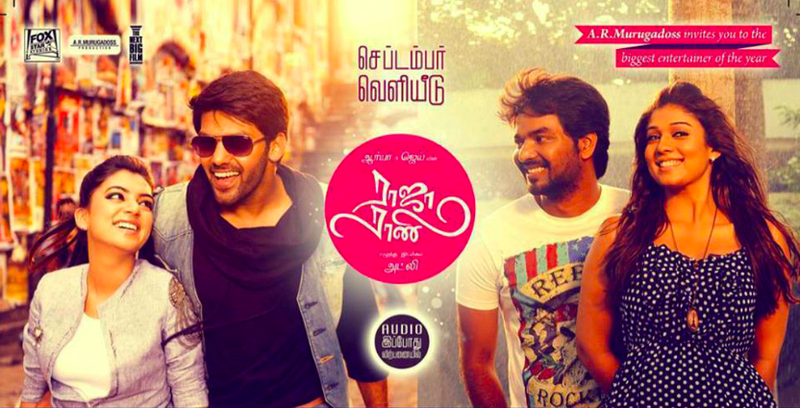 Even though the hero of the film is Arya, Jai scored well in the film. He comes as an innocent call centre boy, who is being ragged by these modern college calls. They literally put him to tears with their anonymous calls to the call centre. Arya has also done well in this movie. The scenes where he chases Nasiriya is something new and adopted to the latest trend. Nayanthara has a meaty role in this movie. She has acted very well all along the movie. The scenes where she calls her dad “darling” or the crying scene in the car are really natural. Satyaraj is having his 3rd innings. Man, he is performing a variety of roles these days. There is no role similar to the other. VVS dad and Raja rani dad are totally different. When he notices that his son-in-law Arya is acting He just says a “thank you” and moves out. “காதலிக்கும் போது தண்ணி அடிச்சவன் காதலை இழந்தவன், கல்யாணத்துக்கு பறகு தண்ணி அடிக்கிறவன் வாழ்க்கைய இழந்தவன்”. There is one particular scene I like. When all the apartment members come to Nayanthara to complain about Arya’ drunken behaviour. When everybody leaves her house, there will be one dog that will come in and complain by barking at her. Kumbakonam became Australia and Railway station become Airport. Could have had a different climax but it is not bad. Atli,A very promising director we can look for in the future.